Over six years ago, we launched AWS Marketplace with the ambitious goal of providing users of the cloud with the software applications and infrastructure they needed to run their business. Today, more than 200,000 AWS active customers are using software from AWS Marketplace from categories such as security, data and analytics, log analysis and machine learning. Those customers use over 650 million hours a month of Amazon EC2 for products in AWS Marketplace and have more than 950,000 active software subscriptions. AWS Marketplace offers 35 categories and more than 4,500 software listings from more than 1,400 Independent Software Vendors (ISVs) to help you on your cloud journey, no matter what stage of adoption you are up to. Customers have told us that they love the flexibility and myriad of options that AWS Marketplace provides. 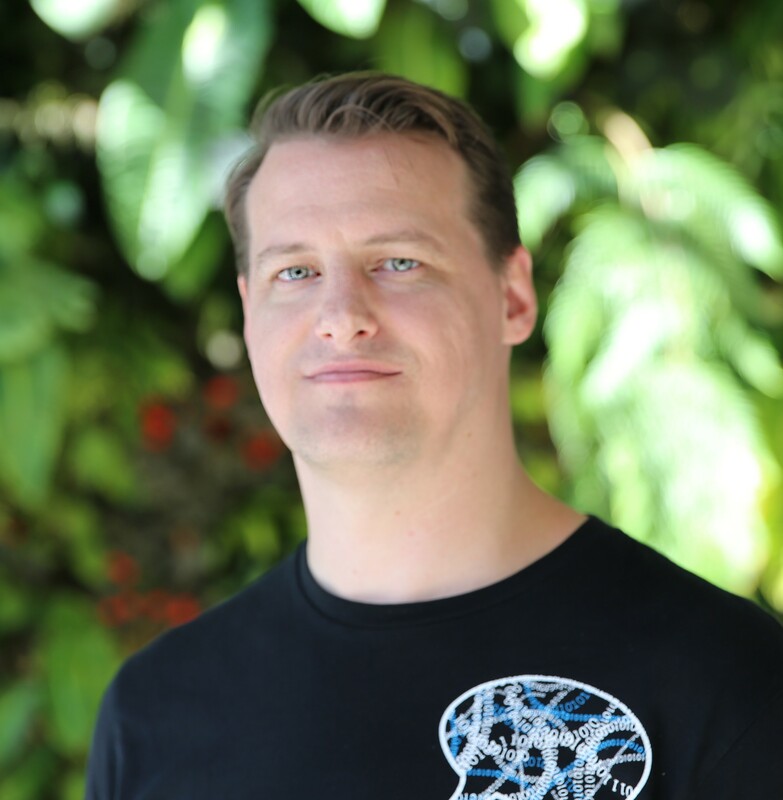 Today, I am excited to announce we are offering even more flexibility for AWS Marketplace with the launch of Private Marketplace from AWS Marketplace. Private Marketplace is a new feature that enables you to create a custom digital catalog of pre-approved products from AWS Marketplace. As an administrator, you can select products that meet your procurement policies and make them available for your users. You can also further customize Private Marketplace with company branding, such as logo, messaging, and color scheme. All controls for Private Marketplace apply across your entire AWS Organizations entity, and you can define fine-grained controls using Identity and Access Management for roles such as: administrator, subscription manager and end user. Once you enable Private Marketplace, users within your AWS Organizations redirect to Private Marketplace when they sign into AWS Marketplace. Now, your users can quickly find, buy, and deploy products knowing they are pre-approved. To get started we need to be using a master account, if you have a single account, it will automatically be classified as a master account. If you are a member of an AWS Organizations managed account, the master account will need to enable Private Marketplace access. Once done, you can add subscription managers and administrators through AWS Identity and Access Management (IAM) policies. 1- My account meets the requirement of being a master, I can proceed to create a Private Marketplace. I click “Create Private Marketplace” and am redirected to the admin page where I can whitelist products from AWS Marketplace. To grant other users access to approve products for listing, I can use AWS Organizations policies to grant the AWSMarketplaceManageSubscriptions role. 2- I select some popular software and operating systems from the list and add them to Private Marketplace. Once selected we can now see our whitelisted products. 3- One thing that I appreciate, and I am sure that the administrators of their organization’s Private Marketplace will, is some customization to bring the style and branding inline with the company. In this case, we can choose the name, logo, color, and description of our Private Marketplace. 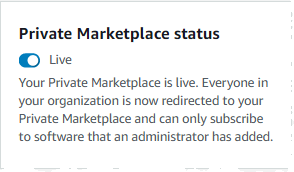 4- After a couple of minutes we have our freshly minted Private Marketplace ready to go, there is an explicit step that we need to complete to push our Private Marketplace live. This allows us to create and edit without enabling access to users. 5 -For the next part, we will switch to a member account and see what our Private Marketplace looks like. 6- We can see the five pieces of software I whitelisted and our customizations to our Private Marketplace. We can also see that these products are “Approved for Procurement” and can be subscribed to by our end users. Other products are still discoverable by our users, but cannot be subscribed to until an administrator whitelists the product. Users in a Private Marketplace can launch products knowing that all products in their Private Marketplace comply with their company’s procurement policies. 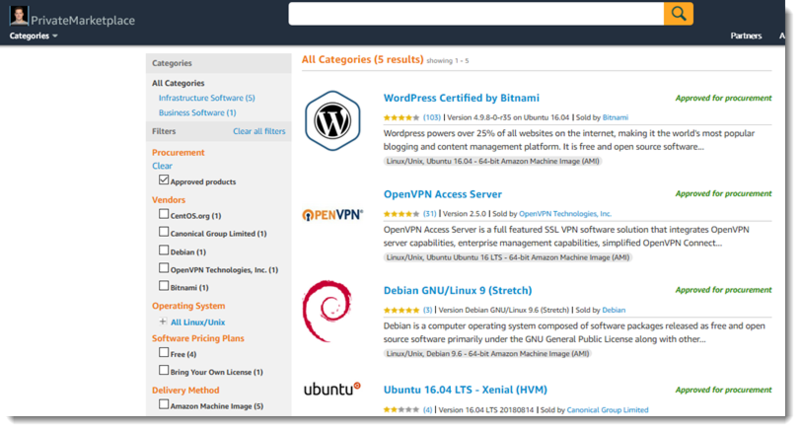 When users search for products in Private Marketplace, they can see which products are labeled as “Approved for Procurement” and quickly filter between their company’s catalog and the full catalog of software products in AWS Marketplace. Subscription costs remain the same as all products in AWS Marketplace once consumed. Private Marketplace from AWS Marketplace is available in all commercial regions today.